The first flight of swans for the winter season 2011/12 arrived Sunday in the Bulgarian Black Sea capital Varna from Scandinavia. 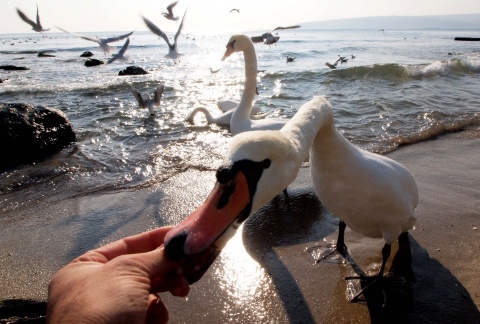 The swans spend the cold season in the sea and lakes surrounding Varna, enjoying contact with humans and enlivening the winter season in Bulgaria's second-largest city. The swans are from the largest swan species, the so-called mute swans (Cygnus olor). Saturday they landed on Varna's Military Officer's Beach to the joy of local residents and Varna guests. The swans arrived just after the first really cold spell in Bulgaria Friday recalled the imminent coming of winter.